Our garden finally decided to be a garden and grow a couple of tomatoes and zucchini. This summer was a bit cooler than usual, so the rest of my stuff (peppers, herbs, artichokes) didn’t really take off. But, the other day, I had a good handful of happy stuff and while savoring the wonderfully fresh smell of my collection, I had an idea. You know I love quinoa (here, here, and here) and it really is a super-food often overlooked. It’s also not challenging to work with and is very versatile. This recipe is so easy and can be adapted for whatever veggies or flavors you like. This healthy side can be on the table in less than 30-minutes perfect for lunch as is or for a side dish at dinner topped with grilled fish or chicken. Preheat your oven to 425 F and start dicing up your vegetables. 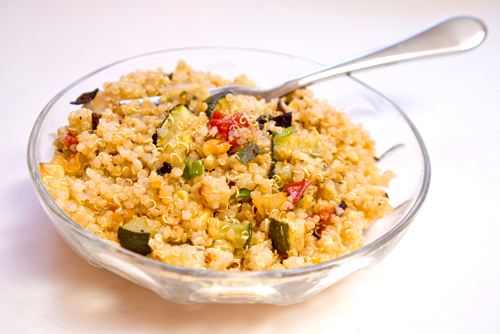 Grab your pre-cooked quinoa from the fridge and break up so there aren’t any big lumps and clumps. Not sure how to make quinoa? Just follow the directions on the box or check out these directions (although I never pre-rinse my quinoa – but go ahead and do that step if you’d like). Place all your veggies and the olive oil on a sheet pan and give things a good stir. You can give everything a little sprinkle of salt, too. Pop those vegetables in the hot oven and let roast for about 10 to 15-minutes and then give a stir. Let them roast another 5 to 10 minutes and then remove from the oven. 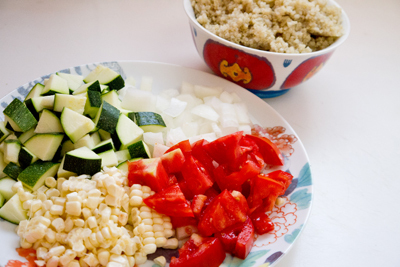 Now sprinkle the quinoa over the vegetables and give another stir. Pop everything back in the oven for another 10 minutes and then remove. In a medium-sized bowl, mix together the balsamic dressing, fresh herbs, additional salt and scallion. 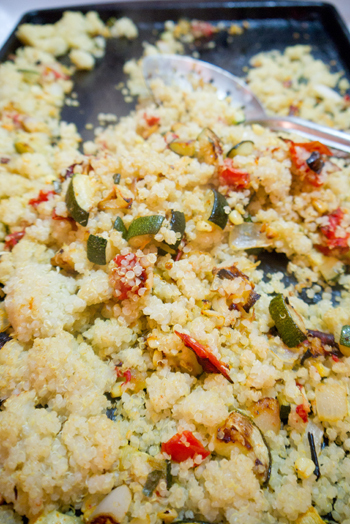 Carefully spoon the hot roasted vegetable quinoa into the dressing and give things a stir. Pepper to your liking. Serve warm or enjoy cool. Either way it is fantastically good.